When King James VI of Scotland ascended to the throne of England in 1603, John Florio (1553-1625), well known as one of the most outstanding interpreters of Italian humanistic culture in Elizabethan England, and the celebrated translator of Montaigne’s Essais into English (1603), chose out of James’s numerous works to translate the Basilikon Doron into Italian. This work represents a lesser known and seemingly less relevant chapter in the history of translation than the Essays, and yet it is particularly interesting for its relevance to both political theory and linguistic practices of the time. This essay will discuss this most unusual case study of early modern translation, aiming to suggest that Florio’s translation worked as both linguistic exercise and a meditation on politics, and to establish some measure of the influence exercised by a major player of Italian culture in Elizabethan England on the political lexicon of early-modern England. ©inTRAlinea & Donatella Montini (2019). "Renaissance Political Theory in Translation: John Florio and the Basilikon Doron"
Politia, policie, politike or ciuill gouernment, the gouernance and rule or policie of a towne or common-wealth, a politike regiment. Politica, a booke written of policie, or touching the ciuill gouernment of a state. Repùblica, a common-wealth, a free estate, the weale publike. A strong wind of change has swept over the vast domain of translation studies for the last thirty years, changing our perception of the historic and cultural significance of translation and repositioning it within the broader sphere of cultural studies. One such macroscopic change is that we have come to abandon the idea of a mere ‘linguistic transfer taking place in a static and binary world of source/target text, source/target language, and faithful/unfaithful, literal/free renderings.’ (Hosington 2015: 8). Eclectic methods and approaches within the area of Translation Studies, pioneered and then implemented by scholars like Susan Bassnett, André Lefevere, Theo Hermans, and Gideon Toury, have drawn attention to the crucial importance of historical and social context for translation: what counts is not solely which words are chosen on the page, but what ideological and social reasons lie behind the translator’s decisions and approach, and what effects they have produced (Lefevere 1992). Translation tends to be presented as ‘manipulation undertaken in the service of power’, thus, engaged in an ideological mission (Bassnett and Lefevere, 1990, preface) which different text-types and different receptors shape and re-address (Reiss, Vermeer 1984). ‘As a result of these and other avenues of translative research’, Hosington persuasively argues, ‘translations are now seen as complex constructs, influenced by time, space, socio-historical and socio-cultural contexts, and the intentions of any one of the multiple agents collaborating in their production.’ (Hosington 2015: 9). All these approaches appear particularly suited to frame European early modern translation practices, which were crucial to the spreading of culture and learning and ‘played a crucial role in enabling greater communication between peoples and advancing social and political movements beyond narrow national borders’ (Hosington 2015: 5-6; Rhodes et al. 2013; Armstrong 2013; Morini 2006; Matthiessen 1931). At a time when national languages all over Europe were seeking to establish a primary role for themselves in the emerging process of the construction of national identities, translations aimed to contribute to the linguistic and cultural enrichment of vernaculars which had to measure themselves up against the prestigious models of Latin, Italian, and French culture, both through imitation and opposition. Italian culture, as we know, had a particularly significant impact in Tudor England, and equally significant was the role played by the small community of Italian Protestant refugees in London during the sixteenth century in the formation of English national identity. A rising nation seemed to be negotiating its nascent image with a precarious group of intermediaries who could depend on no greater resources than those of their cultural legacy, which they essentially communicated by textual means in the forms of a literal and a metaphorical translation of culture, manners, books, and words – with translation understood as translatio studii (Wyatt 2005; Burke 2005; Pfister 2005, 2009; Montini 2008). John Florio was certainly one of the most influential members in this informal community, whose well-deserved reputation came to be attached to his role as one of the most outstanding interpreters of Italian humanist culture in Elizabethan England and to his celebrated translation of Montaigne’s Essays into English in 1603. And yet, in the same year (and an annus mirabilis it was) as King James VI of Scotland ascended to the throne of England, Florio accomplished a work that is less known and seemingly less relevant to the history of translation than the Essays, but one made more intriguing, to say the least, by its likely bearings on both political theory and linguistic practices of the time. He chose to translate into Italian the Basilikon Doron (henceforth BD), the pedagogical treatise on government which James VI of Scotland wrote and addressed to his son and heir Henry in 1599 and later had published in London, in 1603. In the preface to his translation, Florio celebrated the king as ‘Cesarea Maestà’, and stated that his writings were so full of wisdom that they would last forever, ‘ogni secolo’. In this essay we shall examine this unusual case of early modern translation. Texts that dealt with monarchs and their stories were extremely widespread across Europe in the 16th and 17th centuries, and political theory therefore concentrated on the relevant qualities necessary to be a monarch. The study of political ideas in early modern Europe needs be approached in terms of the intellectual context and tradition in which they developed in order to better understand ‘what a particular text is designed to do and how it relates to the political culture in question’ (Baldwin 2007:101). Translations and their implicit uprooting from the source culture and repositioning in a target culture help the reader understand the function and aim of the text translated not just in the target culture but even, as it has at times been the case, its reverse effects upon the culture from which the text originally emerged. There is more. Florio’s BD is an important text, we believe, not only because its ST is of exceptional importance, having been composed by a royal (and living) author; nor merely because it was later translated multiple times and was considered of particular relevance to European politics and diplomacy. Over and above these facts, there is also the purely textual standpoint of a multi-layered work which incorporates a variety of text-types (the complex structure of the BD is made up of two dedicatory epistles, one poem and a pamphlet, which is also a letter) and which engaged the translator’s ideology as well as his stylistic expertise. Ultimately, our aim is to suggest that this translation worked as both linguistic exercise and a meditation on politics, and to establish some measure of the influence exercised by a major player of Italian culture in Elizabethan England on the political lexicon of early-modern England. As scholar and author of numerous works, James was certainly a most learned king: the range of his production includes original poems and meditations on the Bible; translations and prose works on witchcraft and tobacco; works of political theory and, of course, his addresses to Parliament. It is also unusual for his times that he should have had his works published, with his 1616 Folio Workes appearing only a few months after Ben Jonson’s First Folio (McIlwain 1965; Goldberg 1989; Montini 1994). Still, after forty-five years of Queen Elizabeth’s glorious reign, the Basilikon Doron not only acted as an advanced and in some regards controversial visiting card for the new king before his English subjects and the European courts; it also remained his most popular work for a long time. And indeed the book provided the new English subjects with an insight into the mind of this ‘lawfull good King’, who ‘acknowledgeth himself ordained for his people (…) as their natural father and kindly maister’ (King James I 1603: 2-3). King James VI had begun composing his ‘kingly gift’ in the summer or early autumn of 1598 when uncertainty attended his hopes for succession to the throne of England and Prince Henry was only four years old: ostensibly, the work started out as a meditation on death and was duly called his ‘Testament and latter-will’ (King James I 1603: 7-8). In accordance with the humanist tradition, James intended that his work should be a persuasive, instructive handbook of imperial kingship for Prince Henry and his close associates but also destined to reach a wider audience (Cramsie 2009), and was divided into three books: ‘Of a Kings Christian Duties towards God’; ‘Of a Kings dutie in his office’; ‘of a Kings Behavior in Indifferent Things’. The first book was devoted to precepts regarding a king’s relationship to his God: it should be the young king’s duty to act as a good Christian; to love, to serve, and to fear God; to read the Holy Bible, pray assiduously and always be thankful to Him for His mercy. The second book detailed the sovereign’s responsibilities in office: acting as a good king, and not a “tyrant”, he will govern with justice and equality, and will be familiar with his subjects. For his court he must select loyal gentlemen and at war he will appoint old but worthy Captains to lead an army. The third book, finally, covered such ‘indifferent Things’ as made up the daily life of a monarch: his clothing, food, and amusements, as well as his writing and speaking, upon consideration of the fact that the king’s life is ‘a law-booke and a mirrour’ to his subjects, who ‘may see, by [his] image, what life they should leade’. (King James I 1603:61). By design, James’s work followed in the de principe literary tradition – a textual legacy of Western culture dating back to the Classical Age, from Xenophon’s Cyroepedia to Pliny’s Panegyricus and Seneca’s De Clementia, and continuing into the Middle Ages, especially in Northern Europe. A number of early modern humanist treatises, as exemplified by Erasmus’s Institutio Principis Christiani (1516) or Thomas Elyot’s The Book Named the Governour (1531), advocated careful princely education as a prerequisite for good monarchical rule, and emphasis upon the education of princes was a central theme in Renaissance political thought and humanist debate at large. Traditionally, the genre involved the two text-types of specula and institutiones, with the first designed as presenting the ‘mirror’ to the perfect prince and the second as describing the prince’s education. The humanist curriculum was meant as a form of ‘learning for public life’ and a necessary stage in shaping the minds of those who were destined to govern the polity, as the consensus was that this method and curriculum ‘would enhance the commonwealth’ (Pollnitz 2015:9). Besides studying classical languages, students were taught to speak and write eloquently by the precepts of Isocrates, Demosthenes, Cicero, and Quintilian. In observance to a Roman ideal, the liberal education aimed to prepare students to hold their place in the res publica, changed over the upbringing of royal children, and helped reshape the political and religious culture of early modern Britain (Pollnitz 2015: 2). The Erasmian project to mitigate the use of power by means of the liberal arts did not work entirely with English and Scottish princes, but it certainly heightened their interest in letters: princes, male and female alike, would spend more time on biblical knowledge, reading widely and exercising their discursive skills in order to affirm their authority on church and state: they were taught and trained, in other words, to wield their pens like swords. (Pollnitz 2015:15). Although rebelling against the liberal education of his own tutor, George Buchanan, James was one of the best representatives of this ideology of power: in his 1599 prefatory letter to prince Henry, James explained that the purpose of the BD was to instruct him ‘in all the points of his calling’ and urged his son to ‘study to know well [his] owne craft (…) which is to rule [his] people’ (King James 1603:2, 47). Despite emphasizing the similarity between the curricula of royal schoolrooms and those of grammar schools, he argued that ‘princes were distinguished by their calling and that their education must be specific to their divinely ordained duty’ (Pollnitz 2015: 318): they were supposed, that is, to focus their attention on the ‘science of gouernment’. (BD, p.61). It may well be a reflection of the circumstances in which it was published that the Basilikon Doron belongs to that class of books whose immediate success is greater than their lasting fame (Craigie 1944, II:1): it aroused such a great deal of interest that it immediately became the object of numerous translations into many languages. The manuscript, in the king’s own hand, written in Middle Scots and now preserved in BL Royal MS 18. B xv, came out in 1599 and was soon followed by a first Anglicized printed version in Edinburgh, though only in seven copies, by Robert Waldegrave (STC 14348) (Wormald 1991): in fact, this was the first interlingual translation of BD. However, when Queen Elizabeth I died in 1603 and James’s accession to the throne of England was confirmed, Waldegrave printed a second edition, in English (STC14349), so that James’s new subjects could read the book. In a matter of weeks, this edition counted about 14,000 copies, which certainly served to satisfy the interest of the English subjects as to their new king’s principles of statecraft and, thus, enable them to have some foresight about his notions on kingship and their prospects under his government. The textual history of the Basilikon Doron involves a complex relationship among the three extant versions, the manuscript and the two Waldegrave prints. ‘The two which most resemble each other are the autograph MS. and the first Waldegrave print.’ The 1603 edition ‘was far from being a mere reprint of the earlier one, for many changes were introduced.’(Craigie 1944-50, II: 88), the text was so thoroughly revised that hardly a sentence remained as it had been originally written: the first of the two sonnets in the Waldegrave print of 1599 was dropped; numerous marginal glosses referring to classical authors were added; and what is more important, a new section entitled To the Reader was added, about a fifth in length of the original work, explaining among other things why issuing a new version had been necessary. The 1603 copy is certainly the most accurate and representative, not only because it was personally amended by the author, but also because, after 1603, James’s literary works were collected in an in-folio, published in 1616, then in 1620, and finally in 1682 by order of King Charles II. Con questa vanno l’ultimi folij della traduttione del libro del Re d’Inglaterra, commandatici da Vostra Santità, il padre che l’ha tradotto è huomo dotto et confidente et s’ha sforzato d’esprimere la vera sentenza dell’autore, et reddere sensum sensui; ci resta che preghiamo Iddio (come facciamo) che inspiri a sua Maiestà d’esseguir nel suo gouerno, le cose ben dette et scritte in questo libro, et correggere quelle, nelle quali per causa dell’educatione Iddio fin qui non gli ha dato bastante luce o più presto egli non ha aperto l’occhi, il che speriamo per la gratia [hole in MS]…diuina, et con l’aiuto di Vostra Beatitudine potrà far con tempo, et così restiamo pregando, et per la lunga et prospera vita di Vostra Santità la quale Iddio mundi saluator conserue, et questo umilmente baccio li suoi sacri piedi etc. Unfortunately, the result was so poor that the Pope had to ask the Papal Nuncio in Paris for a copy of the Latin translation published by John Norton in London in 1604. The book was also translated into Dutch and printed twice in Amsterdam in 1603, into German and printed at Spires in 1604, into Swedish in 1606, and an even a partial Welsh translation in 1604 was attempted, containing about one third of the complete work. There was, also, a verse rendition by William Willymat, with the text arranged in parallel English and Latin text (Baldwin 2007: 119). As far as Southern Europe was concerned, the translator John Pemberton was commissioned to translate the BD into Spanish, and John Florio translated it into Italian: both editions failed to make it from manuscript to print. The rapid spread of translations across Europe certainly testifies both to the interest the new English king aroused and to the concerted propaganda to launch his political ideas across boundaries. ‘The impetus for translations’, as Baldwin puts it, ‘was James’s desire to be a rex pacificus in a divided Europe, and his identity no doubt helped to sell the work’. (Baldwin 2007: 120-121). As soon as King James settled in London, John Florio sought the means by which to strengthen his link with the new dynasty and presented his own dono regale [royal gift] to the king (Yates 1934:248). John Florio had an established reputation in Elizabethan London (Yates 1934; O’Connor 2004): teacher, lexicographer, translator, ‘Italus ore, Anglus pectore’ (as the inscription on his own portrait records), all his works fed upon negotiations between two countries and languages. His valuable linguistic competence is documented in the conversation textbooks he composed for the teaching of Italian (First Fruits,1578; Second Fruits, 1591), the English-Italian dictionaries (A World of Words, 1598; Queen Anna’s New World of Words, 1611), and translations from French and Italian into English. While Florio’s fame as a translator owes much to his Montaigne, his translations from Italian into English are also worth mentioning: the most prestigious one, although the attribution is still controversial, was Boccaccio’s Decameron (1620) (Wright 1953; Armstrong 2013; Montini 2014); but there is also his A shorte and briefe translation of the two navigations and discoveries to the northweast partes called Newe France (1580), a translation into English of Ramusio’s Italian version of the work by Jacques Cartier; and finally, some parts of Traiano Boccalini’s Ragguagli di Parnaso, which were published after Florio’s death as The New-Found Politicke. The translation of James’s BD, however, stands as a unique enterprise in Florio’s career due to certain linguistic as well as visual and material aspects: the text was in all certainty intended as a tribute to the new king and as a work upon which the Queen, who could write and speak Italian quite well, could exercise herself (Pellegrini 1961:39), and is the only example of translation by Florio from English into Italian (Wyatt 2010). The original manuscript, which went unnoticed for a long time, is held at the British Library as Royal MS 14. A. V. and is a signed holograph translation from the 1603 second edition of BD, although the preface to the Reader is omitted. It was composed on 68 quarto leaves and is bound with an entirely unrelated Italian treatise. Apparently, no printed version of the text was ever produced, despite Florio’s confident expectations, expressed openly in the final lines of his dedication (‘[…] anzi in iscritto, aspettandone la censura, che per istampa, presentando della sufficientia…’). As to issues attending the intended destination of Florio’s translation, which may have been conceived for an Italian readership, it is possible that James’s Protestantism was eventually deemed an insuperable obstacle to surmount ‘to have appeal across the confessional divide’ (Baldwin 2007: 120), unless we take its foremost intended audience to have been the inner circle of the Stuart court. Interesting questions may further be posed vis-à-vis Florio’s omission of the preface: all this would ostensibly go against the campaign to show James’s kingly and intellectual credibility. 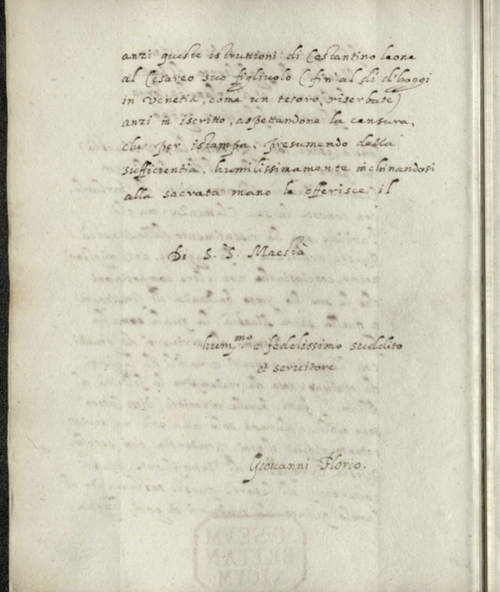 Unlike the Essays, Florio’s manuscript is endowed with a very simple and limited paratextual apparatus, perhaps designedly so with a view to a more elaborated printed edition. The general editorial framework of the original text remained unchanged for the most part, though with omissions and additions made by Florio for his designated audience. After the title page (Fig. 1), the translator’s Italian dedication to the King follows (Fig.2a and Fig.2b) and, as Frances Yates reasonably surmises, ‘from the wording of this it appears that the translation was his own idea and not undertaken by royal command.’ (Yates 1934: 248). As for the remainder of the work, the authorial paratext and the translated text by and large follow the 1603 source text, consisting of, namely, only one sonnet (3r), the letter to Prince Henry (4-5), and tripartite book division James had arranged. As for the “information design” of the book, and especially the mise-en-page of text and paratext, Florio faithfully replicated the layout of his original: James’s marginal glosses are accurately and fully reproduced and collocated in the right and left margins of the page. [2r] Alla sacratissima, et Serenissima Maestà d’Inghilterra, di Scotia, di Francia, et d’Irlandia, longa felicità e felicissimo regno. Now as to your writing, which is nothing else, but a forme of en-registrate speech; use a plaine, short, but stately stile, both in your Proclamations and missiues, especially to forraine Princes (King James I 1603: 47). So Kings should feare and serue their God againe. A’ Rè di Dei Dio non da il nome in vano. A’ Rè temer’, seruir’ lor’ Dio è sano. Qui scritto viceré sei di sua mano. Si sempr’ andrai, com’al suo viso essendo. James proposes the introductory sonnet as poetical equivalent of the theoretical and political programme of regality expounded in the entire pamphlet: the message to the prince and its ultimate educational aim is that a king should model himself on the style of the divinity, becoming a copy and deputy of God on earth. In the first quatrain, three entities, God, Kings, and subjects, are cast in a rigid hierarchical relation, as the simile suggests (ll.3-4): as subjects are called to pay obedience to Kings, so Kings are to God. The second stanza shifts the focus onto the addressee, Prince Henry, whose tasks are unambiguously detailed through a sequence of directives in the imperative which bridge over to the third quatrain, composing a clear-cut catalogue of duties to be accomplished ‘If then ye would enjoy a happie raigne’. The final couplet recapitulates the prince’s goal, as God’s “Lieutenant”, in the formula of a theory of resemblance. There is more. On the same line Florio introduces a radical and seemingly unnecessary lexical shift where James’ ‘stile’ is rendered into Italian as ‘nome’ – which introduces a variant meaning and limits the semantic scope of the original term, whereas the simple use of ‘stile’(It) for ‘stile’ (En) would have permitted an inclusive interpretation: ‘style’ as a mode of expression both political and literary shared by God and Kings. A chi può debitamente appartenere questo libro di istruttioni per un Prencipe, in tutte le particolarità della sua vocatione; tanto generali, come Christiano verso Iddio; quanto particolari, come Rè uerso il suo popolo? Achi (dico io) può egli piu giuridicamente appartenere, che a uoi mio dilettissimo figliuolo? Poscia che a me, autor’ di esso, come a uostro genitor’ naturale, conuiene esser’ sollecito per la uostra pia et virtuosa educatione, essendo mio primogenito figliuolo, e primitie della benedittione d’Iddio uerso me et la mia successione; e come Rè mi fa mestieri, proueder’ a buonhora per la vostra creanza in tutte le circostanze del debito et officio del Rè; stante che in esso uoi siete mio natural’ e legittimo successore: essendo perfettamente raguagliato ed istrutto del pondo postoui in su gl’homeri possiate per tempo cominciare a considerare, che essendo nato ad esser Rè, sete pitosto nato ad onus, che ad honos. As different text-types, epistolary and expository prose, the letter and subsequent chapters in the pamphlet commanded distinct ‘translation tactics’ (Lefevere 1992:97-108); a call to which Florio responded with a translation of a quality as high and literal, as a text written by a living and reigning English king would demand: arguably, the higher the prestige of the original text, the greater was the strain on the translator to keep closely to the author’s lexicogrammar. However, Florio managed to bring inventiveness to the text and expertly altered the import of King James’s precepts so as to convey a message that his intended audience would comprehend. We are sufficiently knowledgeable on translation practices from the period not to expect to find Florio’s notions regarding translation to be detailed in any particular treatise (Morini 2006; Denton 2016; Rhodes et al. 2013): what emerges lies in the paratextual apparatuses, such as the Preface, and the address to the reader in the Essays, out of which Florio’s ideas about translation emerge with some clarity. He thus refers to his target text as a ‘secondary creation’ and to himself as translator as a ‘foster-father’, ostensibly conforming to what we would regard a vertical model of translation. In his translation of BD, Florio confirms his tendency to comply with the reading habits of his age by operating on the plane of elocution; as translator, Florio thus adapts the author’s style of writing to his own, lending a new sound and rhythm to the text (Pellegrini 1961; Montini 2014). As Massimiliano Morini noted, ‘The English discovered that rhetorical translation also meant domestication, for the transformation of rhetorical elements of the original could be effected with an eye on the rights of the target language rather than of the original author. Of course, the paths of the new and the old freedom crossed in the Tudor era.’ (Morini 2006: 28). The text is domesticated to meet the expectations of its new target audience and the structured principle which shapes the enterprise is that of copia, increase, and crescendo, and what Puttenham would call ‘the “climbing” figure of climax, a scheme that presents a mounting over a series of words, clauses or sentences’ (Elam 1984: 252). While operating in different ways upon different linguistic levels (viz. phonemes, lexemes, word order, and syntax), Florio develops a homogeneous strategy of addition and expansion which closely resembles his previous work on Montaigne and is especially to be appreciated at the level of lexical choices (Iamartino 1992; Greenblatt, Platt 2014). Finally, Florio’s re-fashioning of BD is accomplished by recurring devices: the heaping of synonymic nouns, adjectives, and verbs; the constant explication of implicit meanings; the frequent addition of Italian proverbs, to cite the most conspicuous. Examples are to be found scattered across the whole text: from the frontispiece, where ‘instructions’, ‘istruttioni’ is reinforced and doubled with ‘ammaestramenti’ [teachings] and where ‘His Maiesties’ is amplified with ‘della Serenissima Maestà d’Inghilterra, di Scozia, di Francia et d’Irlandia’; to the main text, where ‘My Sonne’ often becomes ‘carissimo figliuol mio’ [dearest son of mine]. As we scan the two texts, we find ‘which bannisheth shame’ (47) rendered with ‘che caccia ogni vergogna, o rispetto’ [which banishes all shame, or reserve] (f.12v. 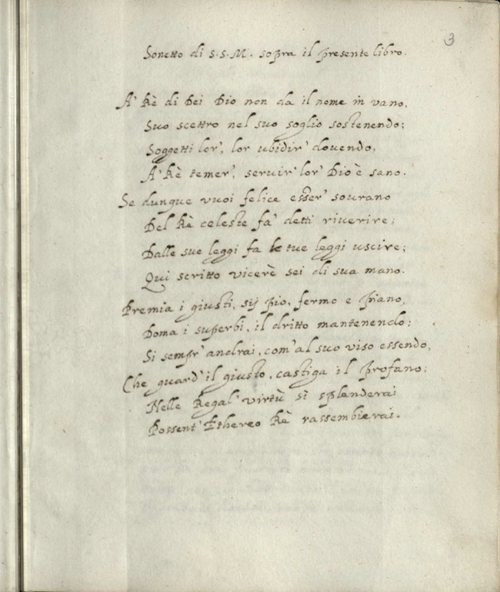 ); ‘as in a mirrour’ with ‘limpido speglio’[clear mirror]; ‘when conscience is a sleepe’ with ‘quando la conscientia è addormentata e sopita’ [when conscience is asleep and slumbering]; ‘frame the common-weale euer to advance his particular’(57) with ‘formare et indurre la repubblica ad avuanzare et secondare il suo particolare’ [inform and induce the republic to pursue and second its particular] (f.15r); ‘the disorder of the country’ (65) with ‘la confusione e disordine del regno’ [the confusion and disorder of the kingdom] (f.17r); and so on. As the examples show, there is a pattern whereby one Italian term (usually the first) is a close match to the English word, while the other contributes a further explanatory note (Pellegrini 1966: 25-38). Egli è nondimeno cosa difficile a cauar’della carne quello che è generato nelle ossa, o come dice qull’antico e trito prouerbio Italiano. Quello che s’ha da natura, fino alla fossa dura. Siate dunque molto circospetto ed aueduto nel’ far’elletione de’ vostri seruenti e seguaci (31r-31v). As for the particular poynts of Religion, I neede not to dilate them; I am no hypocrite, follow my footesteppes, and your own present education therein. I thanke God, I was neuer ashamed to giue account of my profession, howsoeuer the malitious lying tongues of some haue traduced me. (King James I 1603:6, my emphasis). In the ST the author plays on the semantic connection between “tongues” and “translation”, whereas in Florio the characteristics of the tongues are doubled (‘maligne and mendaci’) [malign and mendacious] and their effects amplified (“m’habbiano trafitto, o cerco d’infamarmi”) [have speared me or seek to defame me]. Thus, losing the original pun, Florio makes up by introducing a new one which transparently refers back to the familiar adage, “Ne ferisce più la lingua che la spada” [the tongue injures more (of them) than the sword]. il che non è altro, che un essercitio di religione verso Dio, e di equità uerso il vostro popolo. (7v). There are two major keywords, however, namely common-weal and republic, which may be usefully sought throughout the text both for the meaning to which they alluded in the English early modern context and for the special significance they were attributed in connection with Italian political maîtres à penser, like Machiavelli or Guicciardini. a formare et indurre la repubblica ad auanzare et secondare il suo particolare; fondando la sua sicurezza sopra la miseria de’ suoi sudditi, ed in ultimo (come patrigno e mercenario) attende ad arricchirsi con la ruina della republica. (15r; my emphasis). The “Italian humanist ideals” were unquestionably part of the cultural legacy which Florio, as the “Inglese italianato”, represented and almost personified in Elizabethan England. If it is impossible to envisage a Republican Florio, his choice to translate “Common-weal” as “republica” seems to evoke contextualized interpretations, and it may even allude to specific political programmes which the contemporary reader, the European and learned recipient in this case, could easily understand. In this perspective, Florio’s translation followed a strategy of domestication in which the translator was able to cloak his authorial voice behind the mask of royal authority, presenting the royal precepts to the humanist, Italian-speaking world. In a culturally oriented perspective, Peter Burke suggests six crucial questions to be answered for a correct analysis of early modern translations: ‘Who translates? With what intentions? What? For whom? In what manner? With what consequences?’ (Burke 2007a:11). If we follow his guidelines, the case study discussed in the essay, John Florio’s translation of King James I’s Basilikon Doron, seems to have offered interesting answers to understand the potential role and function in the political context both of the original text and of its translation into Italian, the language of humanistic prestige, along with Latin, in Elizabethan England and early modern Europe. By contrast with the history of Boccaccio’s Decameron, and as for the Essays, Florio overtly accepts and declares the paternity of this translation and does not hesitate over whether to sign his work, presumably in the desire to tightly link his life and fortune to the new king; this aim and the ingrained courtly nature of Florio’s connections, both scholarly and social, certainly explains a lot about the intentions with which the translation was made. This explanation, however, cannot be taken very far. Arguably, the number of languages and translators involved in the enterprise to spread the news about the English monarch’s political ideas testify to the relevance of an event which was potentially influential on politics in many European courts. Florio, the most prestigious Italian-speaking teacher and lexicographer, Montaigne’s translator and a celebrity in Elizabethan London, was certainly considered the most authoritative voice to convey the English royal word into ‘the linguistic and cultural world of the Italian cinquecento’ (Wyatt 2010: 75). His style was well known and accepted as a form of refinement of the English language, with his usual arsenal of devices typical of Euphuism, and ‘translation-as-domestication’ could hardly find a better rendering. The royal court was certainly intended as the first audience: Florio’s aristocratic patrons had been restored to their power by the new king and his reputation was at its peak; Italian ambassadors at the Stuart court, from Venice or from Tuscany, could be the ideal receptors as well as vehicles of transmission to their Italian masters of the king’s political theory of regality and especially of his future political strategies rendered in Italian (Kyle 2012; Petrina forthcoming). However, things turned out differently and both the original book and Florio’s translational enterprise, apparently endowed with the most qualified components to make it a success, faced a number of failures. The Pope put the BD on the Index; Henry, the first elected addressee, died prematurely in 1612 and the booklet had to be re-addressed to James’s second son, the future Charles I, who would die in a few years, defeated and beheaded by the first European revolution against a monarchy. John Florio’s translation, beautifully hand-written by the renowned Italian master, was destined not to be printed and disseminated among the courts of Europe, nor among the Italian courts; and in the absence of a wide and renewed audience, it almost disappeared from view. Florio, John (1603), Basilikon Doron, ouero istruttioni et ammaestramenti della Serenissima Maestà d’Inghilterra, di Scozia, di Francia e d’Irlandia al Prencipe Henrico suo carissimo figliuolo, Royal MS. I4 A V.
Akrigg, G.V.P. (ed.) (1984) Letters of James VI and I, Berkeley, University of California Press. Armstrong, Guyda (2007) “Paratexts and their Functions in Seventeenth-Century English Decamerons”, Modern Language Review: 40-57. ---------- (2013) The English Boccaccio: A History in Books, Toronto, The University of Toronto Press. ---------- (2015) “Coding continental: information design in sixteenth-century English vernacular language manuals and translations”, in Brenda M. Hosington (ed), Renaissance Studies, (29), 1:78-102. Baldwin, Geoffrey P. (2007) “The translation of political theory in early modern Europe”, in P. Burke and R. Po-chia Hsia (eds), Cultural Translation in Early Modern Europe, Cambridge, Cambridge University Press, 101-24. Bassnett, Susan (1998) “When is a Translation Not a Translation?”, in Constructing Cultures. Essays on Literary Translation, Susan Bassnett and André Lefevere (eds) Clevedon, Multilingual Matters: 25-40. Bassnett, Susan, and André Lefevere (eds) (1990) Translation, History and Culture, London/New York, Pinter. ---------- (1998) Constructing Cultures. Essays on Literary Translation, Clevedon, Multilingual Matters. Bricchi, Valentina (2011) “‘Che più gran cosa può desiderare un prencipe da i suoi sugetti?’ Monarchy and Power in John Florio’s Works”, in Queen and Country. The Relation between the Monarch and the People in the Development of the English Nation, Alessandra Petrina (ed), Bern, Peter Lang: 215-38. Bouza, Alvarez Fernando (2001), Corre manuscrito. Una historia cultural del siglo de Oro, Marcial Pons, Madrid. Burke, Peter (2004), Languages and Communities in Early Modern Europe, Cambridge, Cambridge University Press. ---------- (2005), “The Renaissance Translator as Go-Between”, in Renaissance Go-Betweens. Cultural Exchange in Early Modern Europe, Andreas Höfele and W. von Koppenfels (eds), Berlin-New York, Walter de Gruyter:17-31. Burke Peter, and Ronnie Po-chia Hsia (eds) (2007) Cultural Translation in Early Modern Europe, Cambridge, Cambridge University Press. ---------- (2007a), “Cultures of translation in early modern Europe”, in Cultural Translation in Early Modern Europe, Peter Burke and Ronnie Po-chia Hsia (eds), Cambridge, Cambridge University Press: 7-38. Coldiron, Anne E. B. (2012) “Visibility Now: Historicizing Foreign Presences in Translation”, Translation Studies, 5: 189-200. Coldiron, Anne E. B. (2015) Printers without Borders. Translation and Textuality in the Renaissance, Cambridge, Cambridge University Press. Coldiron, Anne E. B. (2015a) “Form[e] of transnationhood: the case of John Wolfe’s trilingual Courtier, in Brenda M. Hosington (ed.) Renaissance Studies, (29), 1:103-24. Craigie, James (ed.) (1944-1950), The Basilicon Doron of King James VI, 2 vols, Edinburgh and London, Scottish Text Society. Cramsie, John (2009) “The Philosophy of Imperial Kingship and the Interpretation of James VI and I”, in James VI and I. Ideas, Authority, and Government, R. Houlbrooke (ed. ), Aldershot, Ashgate: 43-60. Denton, John (2016) Translation and Manipulation in Renaissance England, Quaderni di JEMS, Journal of Early Modern Studies, Firenze, Firenze University Press. Elam, Keir (1984) Shakespeare’s Universe of Discourse. Language-Games in the Comedies, Cambridge, Cambridge University Press. Florio, John (1598) A World of Wordes, or Most Copious, and exact Dictionarie in Italian and English, London. Goldberg, Jonathan (1989), James I and the Politics of Literature, Stanford, Stanford University Press. ---------- (1990) Writing Matter. From the Hands of the English Renaissance, Stanford CA, Stanford University Press. Greenblatt, Stephen (1980) Renaissance Self-Fashioning. From More to Shakespeare, Chicago, The University of Chicago Press. Greenblatt, Stephen, and Platt P.G. (eds) (2014) Shakespeare’s Montaigne. The Florio Translation of the Essays. A Selection, New York, New York Review Books. Hadfield, Andrew (2004) Shakespeare and Renaissance Politics, London, Bloomsbury. Hosington, Brenda M. (ed) (2015), “Introduction. Translation and print culture in early modern Europe”, Renaissance Studies, (29), 1: 5-18. Houlbrooke, Ralph (ed.) (2006), James VI and I. Ideas, Authority, and Government, Aldershot, Ashgate. Iamartino, Giovanni (1992), “Florio’s and Cotton’s Montaigne”, in Early Modern English: Trends, Forms and Texts, a cura di C. Nocera - N. Pantaleo - D.Pezzini, Fasano, Schena, 275-94. Jakobson, Roman (1959/2012) “On linguistic aspects of translation”, in Lawrence Venuti (ed.) (2012), The Translation Studies Reader , 3rd edition, London and New York: Routledge, 126–31. Kiefer, Frederick (1996) Writing on the Renaissance Stage: Written Words, Printed Pages, Metaphoric Books, Cranbury N.J., University of Delaware Press. King James I (1603), Basilikon Doron, or His Maiesties Instructions to His Dearest Sonne Henrie the Prince, London, Richard Field. Kress G. e Van Leeuwen T. (1996) Reading Images: The Grammar of Visual Design, London, Routledge. Kyle, Chris R. (2012), Theater of State: Parliament and Political Culture in Early Stuart England, Stanford CA, Stanford University Press. Lefevere, Andre (1992) Translation, Rewriting and the Manipulation of Literary Fame, London and New York, Routledge. Levin, Carole (2018), “Queen Elizabeth and the Power and Language of the Gift”, in Elizabeth I in Writing. Language, Power and Representation in Early Modern England, D.Montini and I.Plescia (eds), New York, Palgrave MacMillan: 213-232. Love, Harold (1993) Scribal Publications in Seventeenth-Century England, Oxford, Clarendon Press. Lyall, Roderick J. (2002) “The Marketing of James VI and I: Scotland, England and the Continental Book Trade”, Quaerendo 32: 204-217. Machiavelli, Niccolò  (2013) Il Principe, G. Pedullà (ed. ), Roma, Donzelli. Matthiessen, F.O. (1931) Translation. An Elizabethan Art, Cambridge Mass., Harvard University Press. McIlwain, Charles H. (ed.) (1965), The Political Works of James I, [reprinted from the edition of 1616] Cambridge Mass., Harvard University Press. Montaigne de, Michel  (1969), The Essayes, transl. John Florio, London, Blount (repr. Menston, The Scolar Press). Montini, Donatella (1994) “ ‘God giues not Kings the stile of Gods in vaine’. Rapporto tra scrittura e regalità nelle opere di James I”, Merope, (VI), 11: 45-67. ---------- (2008), “John/Giovanni: Florio mezzano e intercessore della lingua italiana”, Memoria di Shakespeare (6): 47-59. ---------- (2014) “John Florio and the Decameron: Notes on Style and Voice”, in Boccaccio and the European Literary Tradition, P.Boitani, E. Di Rocco (eds), Roma, Edizioni di Storia e Letteratura: 89-104. Morini, Massimiliano (2006) Tudor Translation in Theory and Practice, Aldershot, Ashgate. Nida, Eugene (1964) Toward a Science of Translating, Leiden, E.J. Brill. Nocera, Carmela (1990) Studi sulla traduzione nell’Inghilterra del Seicento e del Settecento, Caltanissetta, Salvatore Sciascia Editore. O’Connor, Desmond (2004) “John Florio”, Oxford Dictionary of National Biography, H.C.G. Matthew and B. Harrison (eds) Oxford, Oxford University Press, vol. 20, 165-68. Orsini, N., “’Policy’: Or the Language of Elizabethan Machiavellianism”, Journal of Warburg and Courtauld Institutes, Vol. 9 (1946), 122-34. Pellegrini, Giuliano (1961) John Florio e il Basilikon Doron di James VI: un esempio inedito di versione elisabettiana, Milano, Feltrinelli. Peltonen, Markku, (1995) Classical Humanism and Republicanism in English Political Thought, 1570-1640, Cambridge, Cambridge University Press. Petrina, Alessandra (forthcoming) “Translations facing inwards: James VI/I’s Basilikon Doron”, in Traduire à la Renaissance, Jean-Louis Fournel (ed), Geneva, Droz. Pfister Manfred (2009), "John/Giovanni Florio: The Translator as Go-Between" in Translation Practices: Through Language to Culture, A. Chantler, and C. Dente (eds. ), Amsterdam, Rodopi: 184-202. ---------- (2005) “Inglese Italianato – Italiano Anglizzato: John Florio”, in Renaissance Go-Betweens. Cultural Exchange in Early Modern Europe, A. Höfele and W. von Koppenfels (eds), Berlin-New York, Walter de Gruyter: 32-54. Pocock, John G.A. (1975) The Machiavellian Moment. Florentine Political Thought and the Atlantic Republican Tradition, Princeton, Princeton University Press. Pollnitz, Aysha (2015) Princely Education in Early Modern Britain, Cambridge, Cambridge University Press. Redmond, Michael J. (2009) Shakespeare, Politics, and Italy. Intertextuality on the Jacobean Stage, Farnham, Ashgate. Reiss, Katharina, and Hans J. Vermeer (1984) Grundlegung einer allgemeinen Translationtheorie, Tubinge, Max Niemeyer Verlag. Rhodes, Neil, Gordon Kendal and Louise Wilson (eds) (2013) English Renaissance Translation Theory, MHRA Tudor and Stuart Translations, Vol. 9, London, The Modern Humanities Research Association. Rhodes, Neil, Jennifer Richards and Joseph Marshall (eds) (2003) King James VI and I. Selected Writings, Aldershot, Ashgate. Rollison, David (2010) A Commonwealth of the People. Popular Politics and England’s Long Social Revolution, 1066-1649, Cambridge, Cambridge University Press. Worden, Blair (1991) “English Republicanism”, in The Cambridge History of Political Thought, 1450-1700, J. Henderson Burns, M.Goldie (eds) Cambridge, Cambridge University Press: 443-75. Wormald, Jenny (1991) “James VI and I, Basilikon Doron and The Trew Law of Free Monarchies: The Scottish Context and the English Translation”, in The Mental World of the Jacobean Court, Linda Levy Peck (ed. ), Cambridge, Cambridge University Press: 39-44. Wright, Herbert G. (1953) The First English Translation of the Decameron (1620), Uppsala/Cambridge Mass, Harvard University Press. Wyatt, Michael (2005) The Italian Encounter with Tudor England. A Cultural Politics of Translation, Cambridge, Cambridge University Press. ---------- (2010) “John Florio’s Translation of Kingship: An Italian Baptism for James VI/I’s Basilikon Doron”, in Exiles, Emigrés and Intermediaries. Anglo-Italian Cultural Transactions, B. Schaff (ed. ), Amsterdam/New York, Rodopi: 71-84. Yates, Frances (1934) John Florio. The Life of an Italian in Shakespeare’s England, Cambridge, Cambridge University Press. Elizabethan England saw a great increase in the translation of continental printed books, and there was a particularly growing demand for texts of Italian origin as ‘by the second half of the century Italian had overtaken French as the prestigious language to be acquired by the elite, due in no small part to Elizabethan Italophilia’ (Armstrong 2007:42). The remarkable growth in printed English translations during the XVI century has been shown by the Warwick Renaissance Cultural Crossroads database, which provides the following figures: 1560-1569:370 published titles; 1570-1579: 57; 1580-1589:615; 159-1599:611. Hosington, Brenda et al. Renaissance Cultural Crossroads http://www.hrionline.ac.uk [accessed 14 December 2017]. Craigie dated the manuscript to 1603 (Craigie 1944-1950, vol.2: 171), although others tend to be more uncertain about the date. See Wyatt 2010. King James I’s BD is included among the few cases of translations from Renaissance England to the continent before the 1660s. See Burke 2004: 115-117. In fact, Wormald (1991) claims that the multiple translations from Middle Scots into English contributed to remarkable misreadings and misunderstandings among the English subjects, and for this reason James decided to add a ‘Preface to the Reader’ in the 1603 London edition of BD. 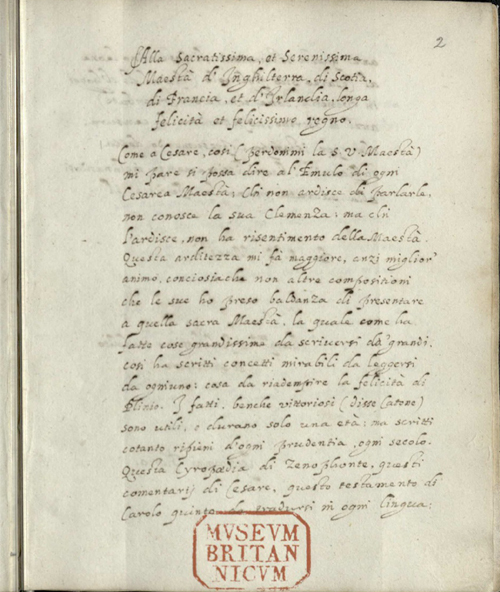 Letter from Robert Parsons to the Pope, Vatican Library, Rome, Fondo Borghese, iv.95. ‘Most Blessed Father, herewith you will find enclosed the last pages of the king of England’s book in translation, ordered by Your Holiness. The Father who translated it is a learned and trusty man; he tried to express the author’s true meaning, and render sensum sensui; all that is left is [to send] our prayer to God (and we do pray) that in his government the King may carry out all the good things written in his book, and amend those which because of his education have not been enlightened by the divine light so far, or which he has not opened his eyes to yet; and we do hope he will perform all this in due time and with the help of divine Grace and Your holiness. Therefore we pray for Your Holiness’ long and prosperous life, that God, mundi salvator, may preserve. Humbly I kiss your holy feet. Your very humble servant, Robert Parsons’ (my translation). However, a few studies have drawn attention to translations in manuscript and to their cultural influence in early modern Europe. See Love 1993; Bouza 2001. Gift exchanges in the early modern period often had much to do with power and patronage. This was especially true in the gift exchanges to monarchs and also between them (See Levin 2018). 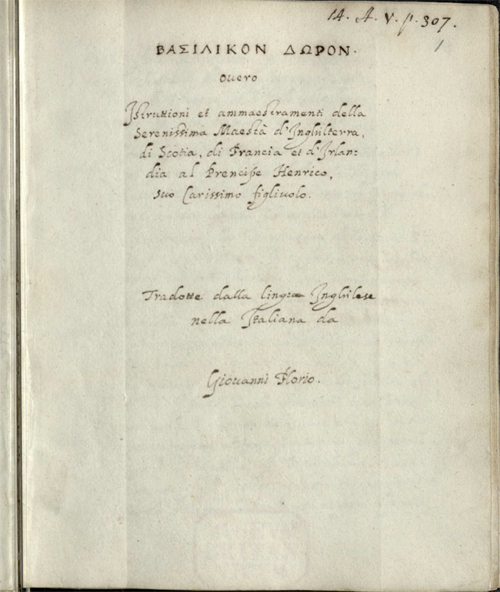 In Italy Florio’s translation had escaped the scholars’ attention until Giuliano Pellegrini accurately introduced and transcribed the manuscript in his John Florio e il Basilikon Doron di James VI: un esempio inedito di versione elisabettiana, (1961). ‘The early modern book is of course a supremely expressive object in and of itself’ (Armstrong 2015: 78) and tells much about the scope and purpose of a text. In the last two decades focus on the book as an object rather than merely as the text in translation, inaugurated by scholars like D.F.McKenzie, Roger Chartier, Jerome McGann, has moved the debate out to the margins of the page and beyond, investigating the ways in which the text is informed by its material and historical contexts and the transformations that can occur as it moves from reader to reader. (Armstrong 2014:4). If one pays due observance to the cultural turn encouraged by bibliographical studies and represented by the frameworks of textual studies and of the history of the book, the peculiar story of the BD qua book adds an interesting dimension to its circulation. Recent studies within the area of descriptive and functionalist Translation Studies have put the spotlight on the role played by the reproduction and visual lay-out in early modern translation books, especially in bilingual textual examples (Kress/Van Leeuwen 1996; Coldiron 2012; Armstrong 2013). ‘The book as object thus serves as a way into the many histories of the mobile text in its production, reception and dissemination over time’. (Armstrong 2015: 78). Writing was part of the prince’s education and specific manuals were compiled to cultivate both how to write and how to indite, as necessary abilities to shape a noble and regal identity. Among the most well known handwriting manuals: Jean de Beau Chesne and John Baildon, A Book Containing Divers Sortes Of Hands (1602); Peter Bales and John Davies of Hereford, The Writing Schoolmaster (1590); Martin Billingsley, The Pens Excellencie or The Secretaries Delight (1618). See also Goldberg 1990. In the letter to the Reader, which Florio does not include in its translation, James writes: ‘It only rests to pray thee (charitable Reader) interprete fauourably this birth of mine, according to integritie of the author, and not looking for perfection the work itself. (…) and specially that since it was first written in secret, and is now published, not of ambition, but of a kinde of necessitie;it must be taken of all men, for the trew image of my very minde, and forme of the rule, which I haue prescribed to my selfe and mine.’ (BD, p.1, my emphasis). And in a letter to Prince Henry in 1603: ‘My son, I am glad that by your letter I may perceive that ye make some progress in learning, although I suspect ye have rather written than indited it. For I confess I long to receive a letter from you that made be wholly yours, as well matter, as form, as well formed by your mind as drawn by your fingers.’ (Akrigg 1984:219-220). My thanks go to the anonymous reviewers to the article who brought to my attention a possible translation strategy which may reveal both foreignizing and domesticating tendencies: in Florio’s Italian version, on the one hand, the sonnet is not rendered into the Italian Petrarchan structure (two quatrains and two tercets), but keeps the English lay-out (three quatrains and one couplet), with a foreignizing effect of the translation as a whole; on the other hand, Florio uses hendecasyllables, which seem to reproduce the rhythm of iambic pentameters and result in a functional equivalent with a domesticating aim. In Oxford English Dictionary the first meaning of both words ‘Common weal/commonweal’ and ‘commonwealth’ is respectively 1. Common well-being; esp. the general good, public welfare, prosperity of the community; and 1. Public welfare; general good and advantage, see Commonweal (www.oed.com/view/Entry/37260 e www.oed.com/view/Entry/372601 , last access: 20/11/2017). On republicanism in early modern England see also: Worden 1991; Peltonen 1995. -political discourse in a synchronic and diachronic perspective (Visione politica e strategie linguistiche, Rub-bettino, 2010).